RICHLAND - In a bipartisan visit to the Northwest's lone commercial nuclear power plant Friday, two Washington state congressmen said they will fight to keep the federal government from permanently abandoning a proposed nuclear waste repository in Nevada. 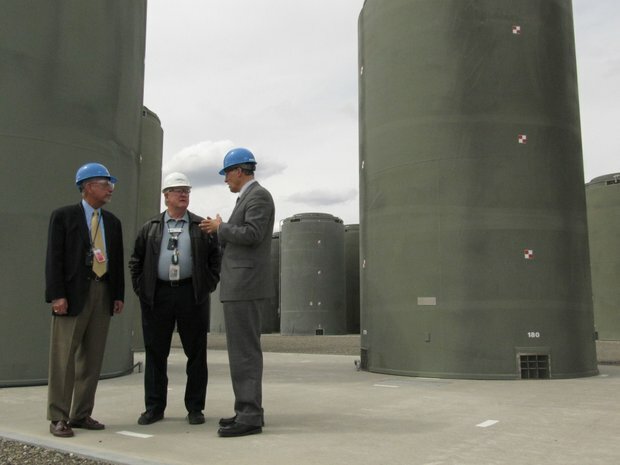 The stop by Reps. Doc Hastings and Jay Inslee, the former a Republican representing largely rural central Washington and the latter a Democrat from Seattle's heavily populated suburbs, highlights the important role a national repository plays in ridding the state of its used nuclear fuel and defense waste. The Obama administration wants to withdraw its application to build Yucca Mountain, a project 90 miles northwest of Las Vegas that has been widely opposed by Nevada officials, including Senate Majority Leader Harry Reid. The Nuclear Regulatory Commission is considering the proposal. Washington state and South Carolina are suing to prevent the government from killing the project. Hastings and Inslee are among a bipartisan group in Congress sponsoring a resolution to bar the administration from cutting funding for the project. Taxpayers have already spent $10 billion on Yucca Mountain, and abandoning at this stage would not make sense, Inslee said. "We do not intend to allow any administration to shut down Yucca and leave us stuck with both a mountain of debt and a mountain of waste," Inslee said. Highly radioactive waste from the contaminated Hanford Nuclear Reservation is intended to go there, as well as spent nuclear fuel from Columbia Generating Station, the Northwest's only commercial nuclear power plant. Ratepayers receiving nuclear energy from Energy Northwest, the public-power consortium that operates the plant, pay a per-kilowatt-hour fee to the Energy Department for construction and operation of the repository. Northwest ratepayers have paid about $290 million into the fund since Columbia Generating Station began commercial operation in 1984. In 2001, with Yucca Mountain not an option, Energy Northwest began installing its own fuel storage canisters. So far, 27 canisters have been built to hold 836 used fuel bundles from the plant's first 20 years of operation, Energy Northwest CEO Vic Parrish said. More will be added next year when the plant goes offline for regular maintenance. "We're prepared to store fuel here for a great many years, but it's a temporary storage," Parrish said. Energy Northwest filed suit in 2004 to recoup those costs, and a court awarded the utility $56.9 million in damages from the Energy Department for failing to begin accepting its spent fuel. The Energy Department recently filed its notice of intent to appeal that ruling. Federal courts already have found the Energy Department in breach of contract for not taking ownership of the spent fuel now being stored at nuclear reactors, as dictated by law. According to industry figures, future liabilities could top $11 billion. Inslee said more than 100 plants are storing 70,000 tons of nuclear waste, and some are running out of room. Storing that fuel at commercial plants in the long term is a bad idea, Hastings said. "If we're going to have robust nuclear fuel policy in this country, we're going to need a national repository," he said. At Hanford, workers are building a vitrification plant that will encase the defense waste in glasslike logs for permanent disposal. That waste and the spent fuel have been designed for storage at Yucca Mountain, Hastings said. Choosing another repository site would require all of those things to be redesigned, he said, potentially costing millions of dollars. Inslee also raised concerns that if Yucca Mountain is permanently abandoned, Hanford could again be considered a potential site for a repository. Hanford was one of three sites being considered for the nuclear waste repository when the federal government selected Yucca Mountain. "We know it's much better to keep it in a dry desert than next to a wet river," Inslee said, nodding to the neighboring Columbia River.